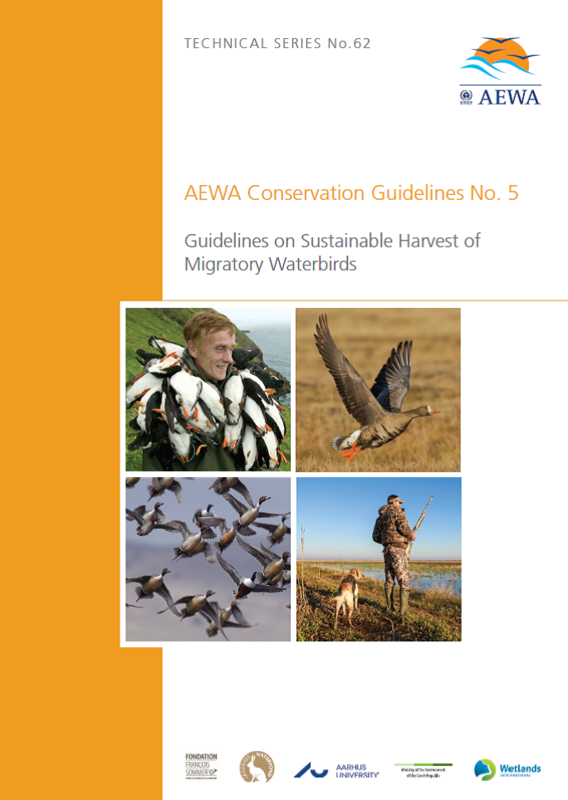 As part of its Conservation Guidelines series AEWA has published a completely revamped version of its Guidelines on Sustainable Harvest of Migratory Waterbirds (AEWA Technical Series No. 62). The guidelines have been update and its scope widened, taking a broader perspective of the harvesting of waterbirds. It addresses the variety of modes and motivations for harvesting found throughout the AEWA region and the implications they have for the management of sustainable waterbird harvests. These guidelines show that effective flyway-wide management can be achieved, as demonstrated by the success of the first examples of adaptive management of migratory waterbirds that have recently been implemented in the AEWA region, which highlight new opportunities for coordinated management. It also covers a number of specific issues related to waterbird harvest that were not covered in the first set of guidelines. The guidelines were prepared and complied by the Waterbird Harvest Specialist Group of Wetlands International (WHSG), on commission by the UNEP/AEWA Secretariat. The full revision of the Guidelines on Sustainable Harvest of Migratory Waterbirds (AEWA Technical Series No. 62) can be found on the Technical Publications section of the AEWA website.